The November Horoscope 2018 is full of vitality, optimism and a spirit of adventure, encouraged by the entry of Jupiter and the Sun into Sagittarius, while Venus and Neptune will culminate their retrograde phases in this period, clarifying the sentimental panorama. This astrological climate will be complemented with the entry of retrograde Uranus in Aries, the apparent retreat of Mercury in Sagittarius, and the activation of the Lunar Nodes in Cancer and Capricorn. Do you want to know more? With Jupiter and the Sun active in House IX of Aries, there is interest in expanding your horizons, through travel or cultural exchanges. Proposals to undertake business or academic activities abroad are also considered. Read the November Horoscope for Aries here. The entrance of the North Node in House III of Taurus, means that you must detach yourself from pride and connect positively with the people around you. Read the November Horoscope for Taurus here. The entrance of the North Node in the House II of Gemini is the perfect opportunity to reinvent yourself, change the scale of your values, and free yourself from everything that threatens your self-respect. Read the November Horoscope for Gemini here. Ceres at House V of Cancer talks about reconnecting with siblings, but also about rediscovering romance and pleasure. However, if you do not pay attention to what’s pending, it is possible that the “ghosts of the past” will interrupt your idyll. Read the November Horoscope for Cancer here. In Leo’s House V, the retrogradation of Mercury will take place, which means that hasty decisions (about children, romance, and projects) will be going through a second filter, before giving the definitive answer. Read the November Horoscope for Leo here. The activation of the South Node in House V of Virgo, where Saturn, Pluto and the asteroid Vesta meet, announces the reunion with people of the past, important at a sentimental level. Read the November Horoscope for Virgo here. November is emerging as a positive period for Libra. The entry of Mars into House VI of the sign (06/11) facilitates the organization of pending assignments, and the determination to assume leadership. Read the November Horoscope for Libra here. Venus retrograde in House XII of Libra, during the first fortnight of November, constitutes an unequivocal sign of the appearance of old loves, or the repetition of situations that you thought were overcome. Read the November Horoscope for Scorpio here. The entry of asteroid Pallas in the House XI of Sagittarius will be an excellent tool to mitigate the damage caused to your group of friends by the retrogradation of Venus in this sector of the astral map. Read the November Horoscope for Sagittarius here. Jupiter will enter House XII in Capricorn on November 8, allowing positive lessons to be drawn from contrasting events that would have caused discomfort in the past. Read the November Horoscope for Capricorn here. Neptune, planet of the depths, will begin its direct phase in House II of Aquarius, generating improvements in the financial aspect. However, it is important that before making a significant purchase, you ask for advice, or you could be disappointed. 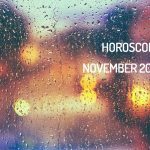 Read the November Horoscope for Aquarius here. As part of its retrogradation, Uranus will enter House II of Pisces, which implies little planning of expenditures, which can cause real mishaps in the budget. Read the November Horoscope for Pisces here.